Experience is becoming a crucial factor for employers when deciding who gets their foot in the door. It’s strongly advised that students and graduates take the opportunity to complete a period of work experience to ensure they have a competitive advantage over their peers; and that’s where an internship can make all the difference. The Erasmus Impact study confirms that people who pursue internships abroad are half as likely to face long-term unemployment than those who don’t. 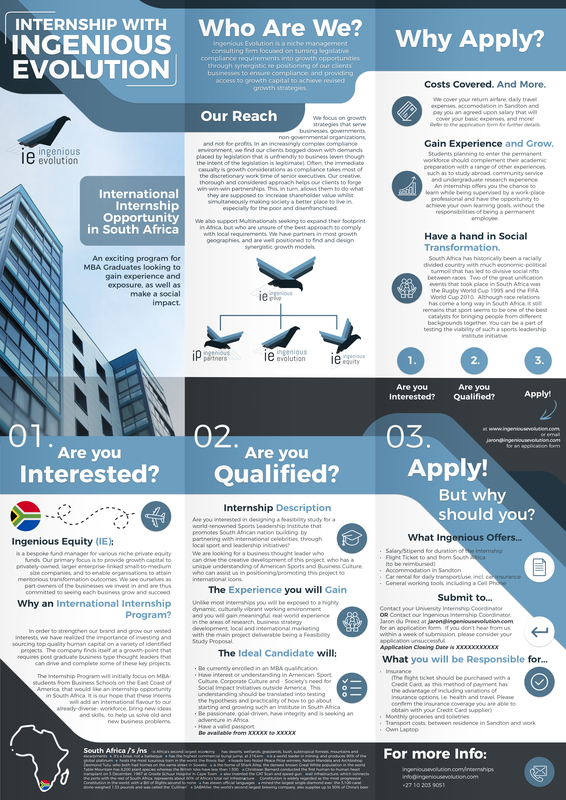 Why an International Internship Program at Ingenious? To strengthen our brand and grow our vested interests, we have realized the importance of investing and sourcing top quality human capital on a variety of identified projects. The company finds itself at a growth-point that requires post graduate business type thought leaders that can drive and complete some of these key projects. The Internship Program will initially focus on MBA-students from Business Schools on the East Coast of America, that would like an internship opportunity in South Africa. It is our hope that these interns will add an international flavour to our already-diverse-workforce, bring new ideas and skills, to help us solve old and new business problems. South Africa has historically been a racially divided country with much economic-political turmoil that has led to divisive social rifts between races. Two of the great unification events that took place in South Africa was the 1995 Rugby World Cup and the 2010 FIFA World Cup. Although race relations have come a long way in South Africa, it remains that sport seems to be one of the best catalysts to bringing people from different backgrounds together. Frans Nortje, Lead Strategist at Ingenious Evolution, has harboured a dream that coincides using the vehicle of sport to develop local leadership and advance unity amongst different people-groups. He envisions a world-renowned “Sports and Business Icon Leadership Institute” initiative, as a concept design that should be tested for project viability. There is a lot of local admiration for African American Sports and Business icons who have demonstrated their success in different fields of human endeavour. Are you interested in designing a concept proposal for a world-renowned Sports Leadership Institute that promotes South African nation building, by partnering with international celebrities, through local sport and leadership initiatives? We are looking for a business thought leader who can drive the creative development of this project, who has a unique understanding of American Sports and Business Culture, who can assist us in positioning/promoting this project to international icons. Unlike most internships you will be exposed to a highly dynamic, culturally vibrant working environment and you will gain meaningful, real-world experience in the areas of research, business strategy development, local and international marketing with the main project deliverable being a Feasibility Study Proposal. → Be currently enrolled in an MBA qualification. → Have interest or understanding in American: Sport, Culture, Corporate Culture and - Society’s need for Social Impact Initiatives outside America. This understanding should be translated into testing the hypothesis and practicality of how to go about starting and growing such an Institute in South Africa. → Have a valid passport that is current for at least 6 months from the internship arrival date. → Be passionate, goal-driven, have integrity and is seeking an adventure in Africa. → Primary vision is to be a world-renowned Sports Leadership Institute that promotes South African nation building, by partnering with international celebrities, through local sport and leadership initiatives. → The focus will be to seek suitable celebrity partners that are willing to build an international brand that promotes values that support healthy nation building. → Please complete the application form below and submit it to Jaron du Preez at jaron@ingeniousevolution.com, the designated IE Program Coordinator. → The application closing date is 15 August 2018. → This is a 90-day internship that will start on 03 September 2018. Read through the internship program and the current project available and make a choice. Download our brochure for more indepth questions and answers that you might have. If you are the correct candidate for the internship, you would join our great team. We serve multiple multinationals operating in Southern Africa, with a specific focus on the automotive, financial services and telecommunications sectors.